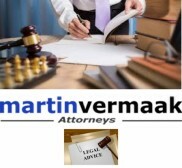 Martin Vermaak Attorneys is the best Business and Family Law Firm based in Johannesburg, South Africa. Martin is a Director of Martin Vermaak Attorneys and has full responsibilities for the management of the Firm\'s offices in Sandton, Randburg and Pretoria. We have an Experienced Divorce Lawyers Team. Our team provides the best services. We listen to the needs of our Clients and supplying great, legal advice and strategy.